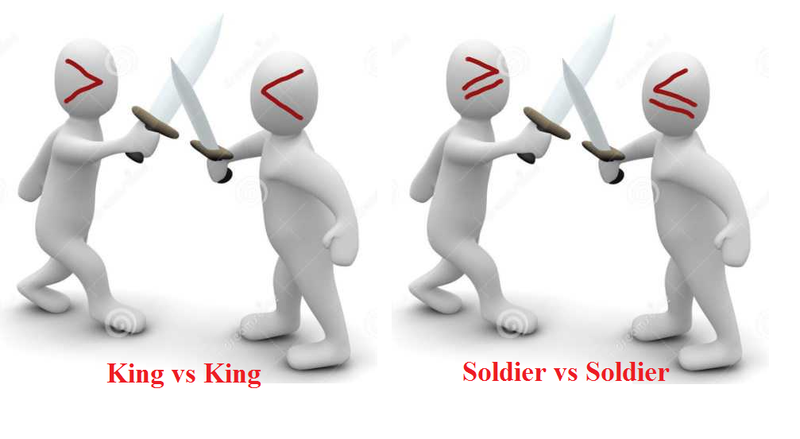 Today I am going to share King Soldiers and Public technique to solve Inequalities. By using this technique, you can solve any question from Inequalities within 10 seconds. In every exam, at least 5 questions are asked from this topic. Suppose there is a war going on between two kings.Whenever the two kings face each other means war. In other words, conclusion will be wrong. Note: Two signs opposite to each other will make the conclusion wrong But again if the signs are in the same manner that will not make it wrong. If A > B < C > D then A < C = False , C > A = False . If E > F > G > H then E > G = True , F > H = True , E > H = True. In simple way ,Whenever these two sign comes in opposite direction the answer will be false. Whenever the soldiers face each other means again war(same apply here). In other words, conclusion will be wrong. Note: Two signs opposite to each other will make the conclusion wrong But again if the signs are same then it will be true. If A ≥ B ≤C then A ≤ C = False , C ≥ A = False . If A ≥ B ≥ C then A ≥ C = True , C ≤ A = True . 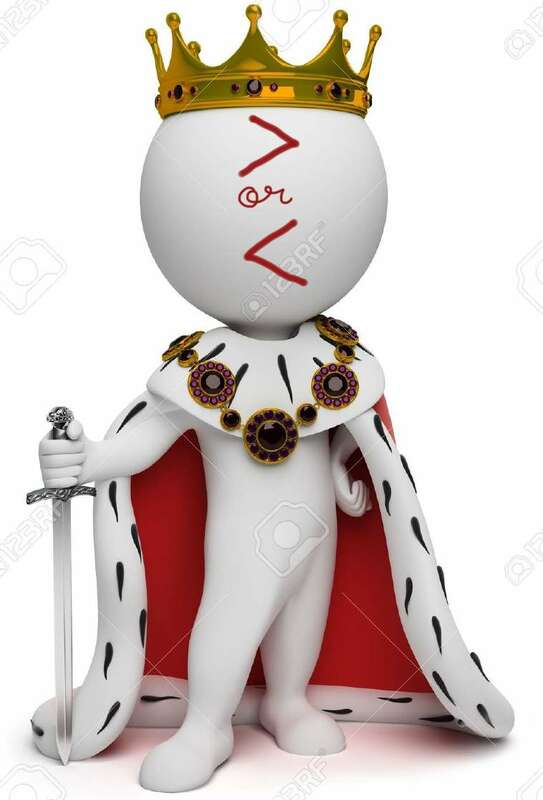 If they all come in order then kings’ priority will be first, soldier's second and public at last. Change the sign into similar opposite / corresponding/alternative direction . 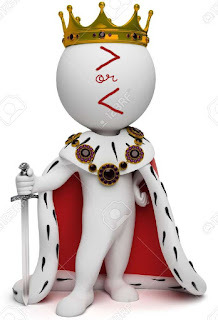 There are some rules on the battlefield which is that king only fights with king and soldier only fight with a soldier. 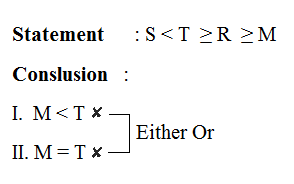 So Whenever you find two conclusions which are false Just check for these two symbols.In Most of the cases where two conclusions are false and these two similar signs are not there respectively than that statement, you can call it as Either Or but should check there variable it should same. 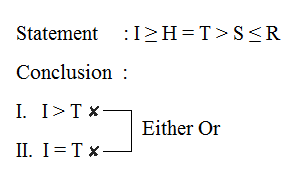 then if it is there then check whether the two variables are same If It happens then write it as 'Either or' but after checking their symbols. 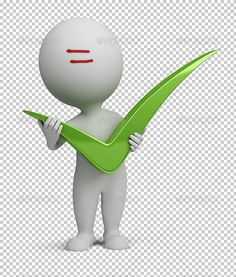 If 3 Condition is satisfied then write it as " Either Or' Otherwise leave it. 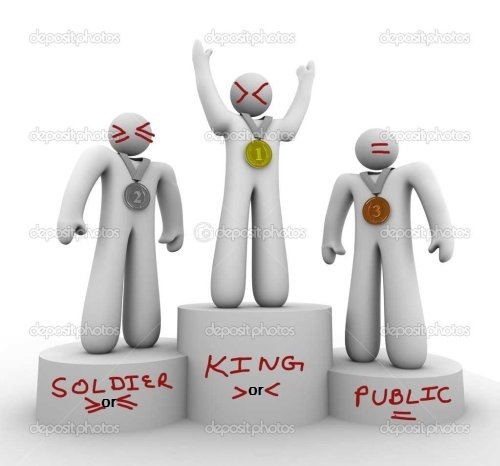 There are some rules in battlefield which is that king only fights with king and soldier only fight with soldier. 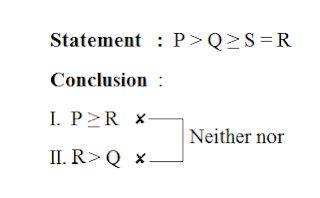 So Whenever you find two conclusions which are false Just check for these two symbols.In Most of the case where two conclusions are false and these two signs are not there respectively than that statement, you can call it as Neither Nor. then write it as 'Neither Nor' but before checking their symbols. 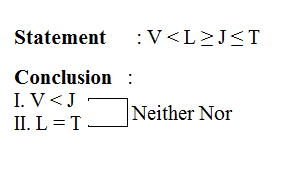 If Both Conditions are satisfied then write it as " Neither Nor' Otherwise leave it. Note:- Many of you might find this trick funny and baseless but it works! I have lot more tricks to share. Stay updated. Give me your opinion in the comments. You did a splendid job. Keep creating such out of the box idea to explain reasoning in a fun way. have pnb declared any joining details of clerk or any list of candidates??? link 1 or 2 is not downloaded. please tell all are same. What is the cut off in PO pre eaxams. how it is possible by above method? 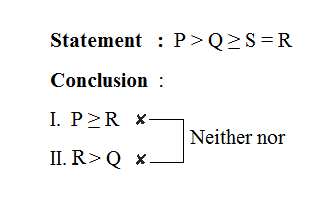 Note: Case 1 or 2 basically says that sign in opposite direction will automatically makes the conclusion wrong.It does'nt matter whether it's king(< or >) or solder(≤ or ≥) are against each other. Sir in your sbi prelim model paper 1 in 65 que of input output foue steps are required to complete rearrangement..nd there in ans 3rd nd 4th steps are repeated..so thats wrong na?? sir i have a doubt! A < E → False! 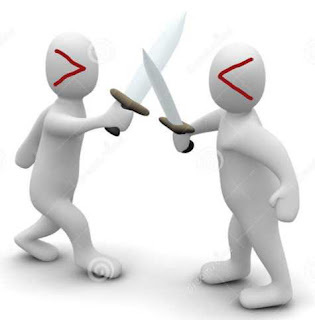 But A < , < E both are same direction symbols! how it is possible? this is my big confusion! without understanding this, i unable go to next step! would you help me? please? 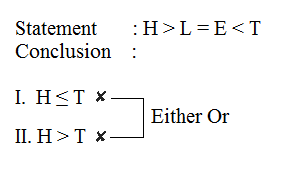 If ur conclusion is A > B then flow from A to B if u encounter at least one " > " symbol then the conclusion is correct.The same case also true for A < B. In case A ≤ B then flow from A to B such that all symbols u encounter are either all " ≤ " or a mixture of " ≤ " and " = ". If u encounter any other symbol during ur encounter then the conclusion is wrong. In case of A = B, flow from A to B and all symbols u encounter must be " = ",if u encounter any other symbol then conclusion is wrong. in every case first move from starting to ending i.e. if A > B ,then start from A and end at B , If u are unable to move from A to B then the conclusion is wrong. Thanks for the post......for syllogism plz post tricks...for this venn diagram is best or not??? I am bad at Hindi ! same thing i said that Just two opposite signs makes the conclusion wrong . listen.. do u hav any tricks for solving machine i/p & o/p qns ?? or r u goin by d same traditional way of writing evry steps representing evry term by their first alphabet ? then pls pls ..provide the link. sir pls do the needful.. mujhe bahut jarur hai aise question ko solve karne ki..
Thnx Sir plz do post some tricks to solve quadratic equations also..
oh super! now i understand! thank you so much for your reply! such a good service! i like it! I just make it easy and basic things were discussed.One time the person He/she understand the base .he/she will became capable of doing himself/herself better than us & this question is edited now for your convince. I have tricks for Machine i/p and will add for u but will take some days. You have edited the content, but it is still wrong. Please do not edit anything for my convenience rather edit it if you find it wrong. These are logical things and if one learns a wrong logic, it would not be possible for him/her to solve these questions ever. Let us take the above case as example. 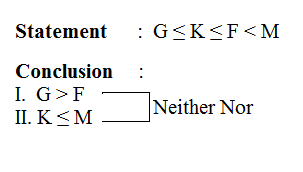 which implies K = N, which has been given as false by Statement II. 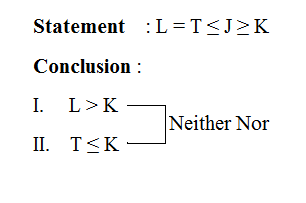 Thus K < O is true, which is given false by statement I. 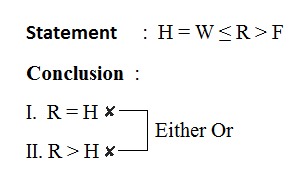 For egs in statement A>BD conclusion is A<D then which two signs to be considered between A & D????? Ma'm can u pls clarify my doubt that it officers are placed in only regional offices or every branch requires an it officer? K < O = FALSE. Thnxxx..sir.. these tricks works.... nd rememberable also .. 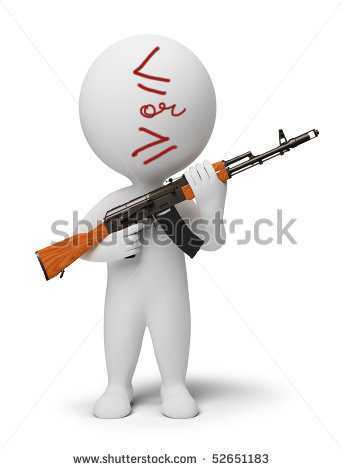 In tat image P>Q is ryt or wrong???? Sir, what's the average marks required to pass in each subject?? What if i score 10 in QA , 28 in Reasoning and 20 in English?? Sir plz reply ASAP..
it is a R>Q . i have typed wrong. You Forget this logic that i hav replied with resp. to ur query. i know it is not good rather we can talk about the logic that i post above here on this page.You were earlier right about your question which i have changed then.If you have any query relating the above given post then plz ask otherwise i know the logic i hav tries to understand ur query was not enough or capable. no problem bro i m in no hurry i will wait till 20th.hope you will not forget your promise. K < O=TRUE. As 2 < 5 is a fact that can not be denied. yup ! i knew it while reading ur previous reply.so i was saying the one i posted now we should consider that. We are working on it. It will be fix till tommorow evening . K<O =FALSE & K=N =FALSE simultaneously true. Sir! 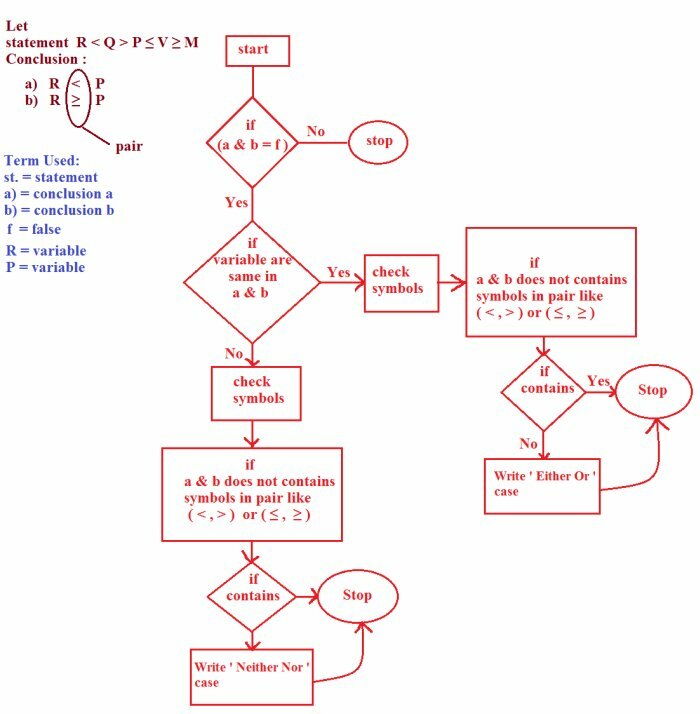 you are still at there.I have given enough method logic tricks above to solve these equation easily.The point is to solve the question in seconds. hi, how was ur papar ? It looks lengthy.............for ur understanding purpose i elaborate it lengthily. Plz tell me whether u understand it or not............if not then tell me at which point u face difficulty. If u understand it properly then try solve few problems based on it. If u face difficulty then u can post here or send it to my mail id " biswajit141@gmail.com "